Thien Nguyen, also known by his fans as Chunli, works eight to nine hours a day as a concept artist and illustrator in a studio in Vietnam. Coming home at night to unwind, he boots up his computer and turns on Photoshop to work on his commission-based illustrations. “It’s almost my whole day. It takes all my time but thankfully I love it!” says Thien. This love for fantasy art shines through in his new illustrations for Shadow Era: Shattered Fates. Thien’s art is the accumulation of 9 years of experience and his constant drive to improve his craft. He is keen to learn from books, his colleagues at the studio, and by taking as many specialty courses and workshops as possible. He has attended FZD workshops in Singapore and completed CGWM online courses. Using Photoshop 9 CS3, a little ZBrush and DAZ 3D with Wacom Intuos 4, his starting point for each illustration is the background story of the character. 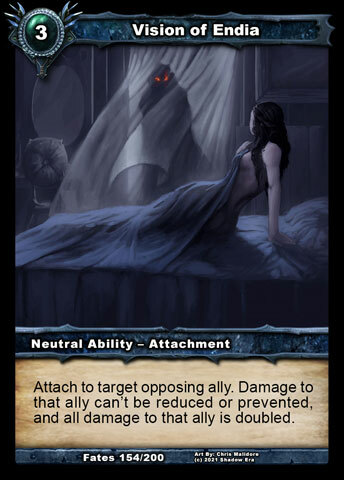 Shadow Era’s design team has carefully crafted a deep storyline behind each expansion and each card. “For the Aldmor Accelerator card, we wanted it to have a mix of magical and warrior qualities since it was a neutral item. 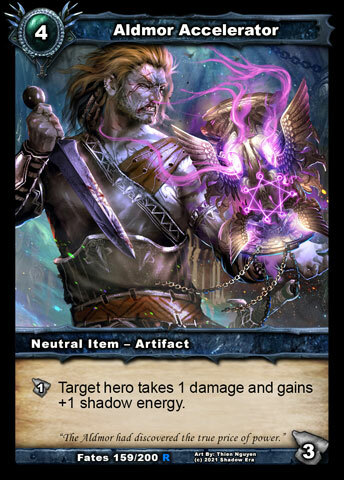 We had a general idea that the cards should have a male character holding a metal vessel with shadow energy, which ties into the Shadow Crystal lore we’re revealing in Shattered Fates. This card also introduces a new mechanic to the game: artifacts with durability. Thien really made that all come together and brought it to life,” explains Kyle Poole, the creator of Shadow Era. Representing the shadow energy in this illustration has so far been Thien’s favorite experience working with the Shadow Era design team. “This drawing was the first time I tried some new art techniques and it worked! It looks clear, it’s colourful, and has many details,” commented Thien. Thien's passion for detail and the fantasy realm shines through in each card. “The Shadow Era design team gave me a detailed brief with the description about the character, the story it is about, details on the outfits, but then also gave me space to for me to imagine and insert some creativity. It’s great to have that background story to start with but then have the freedom to be an artist,” explains Thien. And Shadow Era players are loving what Thien has done often listing him as one of their favorite artists on the official forums. He should probably try moisturise. His picture shows he has aged quite a bit.